When your air conditioning stops working, you don't want to wait any longer than necessary to get it fixed. The AC repair specialists at R Fulton Improvements are ready to handle your repair have been repairing air conditioners for over 20 years. Our licensed service technicians are experienced in repair work for all types of A/C systems, including: portable air conditioners, split systems, and central air conditioning systems. Call (678) 251-9181 for prompt air conditioning repair service. We carry all major brand air conditioning parts and supplies in our service vehicles. R Fulton Improvements has been keeping residential and commercial clients cool and comfortable for more than 20 years. Call (678) 251-9181 to schedule repair service for your air conditioning system. Annual inspections and tune-ups of your residential or commercial air conditioning system are less expensive than paying for costly repairs or system replacement. Not to mention, less frustrating. 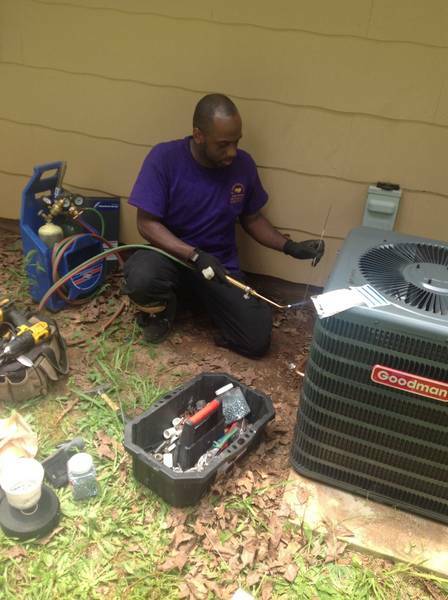 Call (678) 251-9181 to schedule an inspection or tune-up of your air conditioning system. We always give free estimates. Is your AC system energy efficient? R Fulton Improvements specializes in air conditioning system design/redesign for new construction, renovation projects, and system upgrades. If you have recently completed a home renovation, your current air conditioning system may not be adequate. Our system engineers will perform a load calculation to determine whether or not your system is up to snuff. Furthermore, if you have an older system, it may not be energy efficient. R Fulton Improvements has been in the HVAC business over 20 years, providing quality air conditioning service and expertise. Call (678) 251-9181 for more information.